I found this recipe a few years ago when searching for a quick and easy cookie recipe. I wanted something I could put together in a short time while preparing dinner or shortly after on a busy school night. I’ve used it so many times, and modified it here and there. Find my version below! My kids love chocolate and cookies. They also love helping out in the kitchen. This is a great kid friendly recipe they can be apart of and enjoy with me. When I first came across this recipe, I was a bit skeptical. I wasn’t sure how these three main ingredients would make a decent cookie. However, they come together in an amazing way. These cookies are soft, fluffy and delicious! They have an under note of the cake flavor you are using, which makes it even better. It’s like eating a slice of cake and a cookie at once. The centers are moist and gooey, while the outsides make for the perfect bite. There are also so many variations you can try. Mix and match to find your favorite. 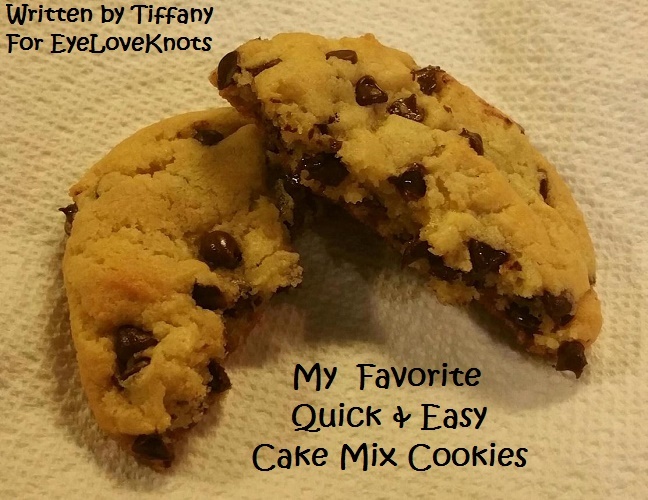 This recipe was written by my awesome cousin, Tiffany, for EyeLoveKnots! 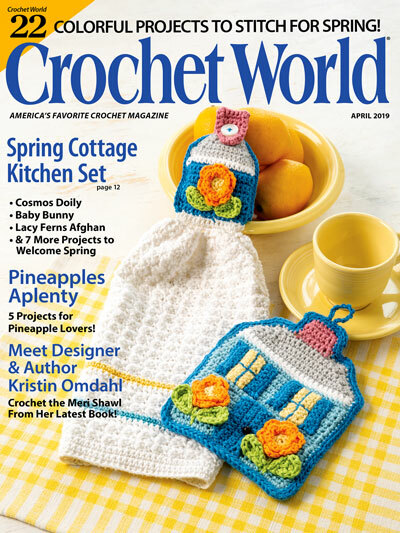 She loves baking and DIYing, and is going to be joining us more often. Want to see something specifically? Drop us a line below! – Your favorite candy bars chopped into small pieces. Preheat oven to 350 degrees. Lightly grease a baking sheet. Add chocolate chips and mix by hand until combined. Drop 1-inch balls onto baking sheet about two inches apart. Bake 8 to 12 minutes, depending on your oven. I usually slightly undercooked mine to make them nice and gooey in the center. 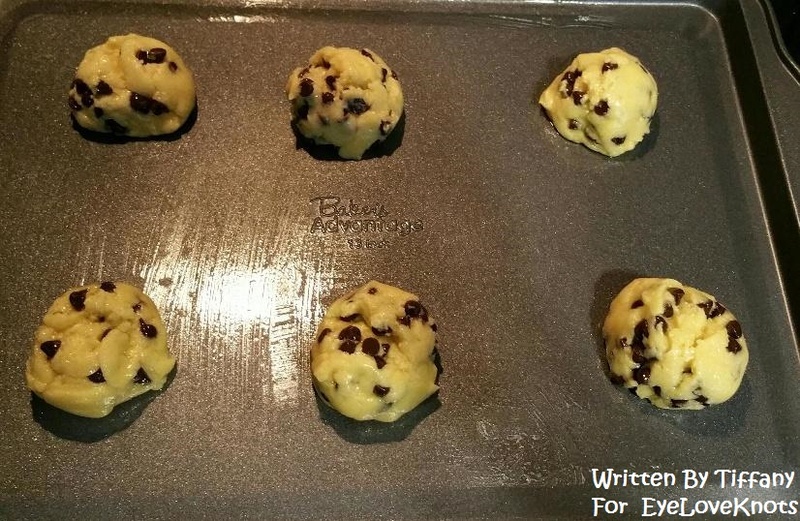 Let rest on the cookie sheet for about 2 minutes, then place on parchment paper or cooling rack. In these pictures, I use mini semi-sweet chocolate chips. Any size will work. I just happen to have the mini ones on hand. The cookies may appear a bit lighter in color. I look for a slight golden brown around the edges to gage when they are done. Please DO NOT claim this recipe as your own nor should you sell this recipe, and DO NOT re-publish these photos as your own. DO NOT copy and paste this recipe anywhere, link to it instead. 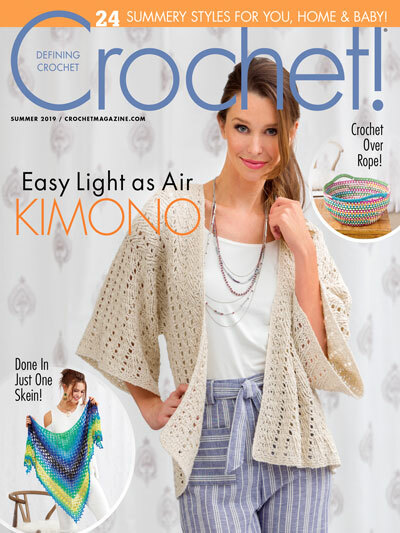 Don’t miss out on new crochet patterns, reviews, jewelry tutorials and more! 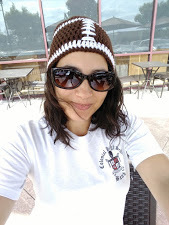 Subscribe to EyeLoveKnots by using the box on the right side toolbar, or follow me via Bloglovin! Yum! 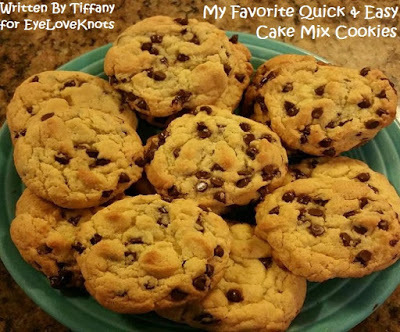 I have a similar recipe and it is great for kids helping in the kitchen. 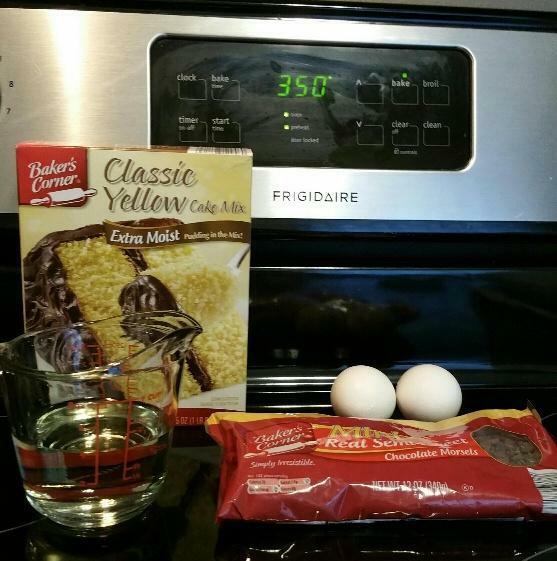 Super easy with the cake mix. Thanks for sharing! And they taste soooooo good! I was thankful enough that my cousin, Tiffany, shared some with me afterwards.